Restaurants are capturing more sales by offering savory and spicy desserts. In fact, more than one-third of diners are interested in a savory indulgence to cap off a meal, according to Datassential MenuTrends. 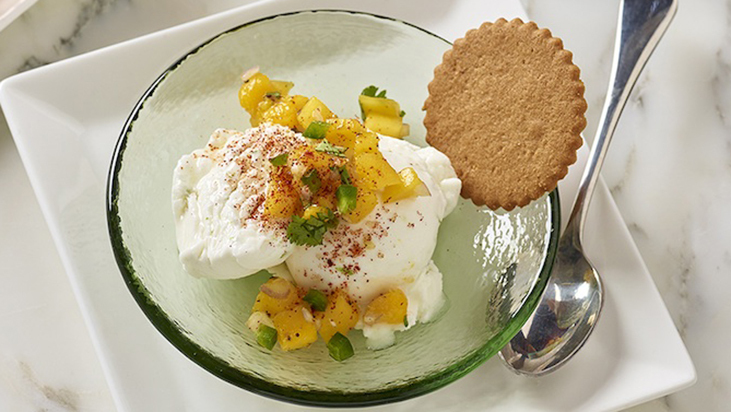 Chef Susser balances the sweet-heat flavors of mango, jalapeno and chipotle for a grownup sundae with a kick. In medium bowl, combine mango, shallot, jalapeno, lime juice and cilantro for chow-chow. Season to taste with 1 1/2 tsp. salt and pepper. Mix the sugar, chipotle powder and 1/2 tsp. salt in medium bowl. Per serving, scoop 1/2 cup sorbet into a dessert bowl. Top with 1/4 cup mango chow-chow. Sprinkle with sweet chili dust and serve with a cookie.